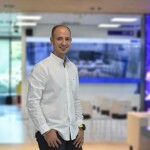 Ignasi Barri works on business development and innovation around digital transformation at GFT. He has over ten years of experience working in R&D and creating new value propositions for the banking industry. His current responsibilities include building innovative solutions to banking’s challenges by applying exponential technologies such as machine learning, mobile and cloud computing, blockchain, augmented and virtual reality, among others, all while employing a design-led approach. To accomplish these goals, he leads multidisciplinary teams that range from designers, data scientists, and full stack developers, as well as start-ups, to help accelerate market adoption of new solutions. Ignasi has a bachelor’s degree in business administration and holds a Ph.D. in computer science from the University of Lleida.